LoD sold less than 200k or you don't have that data? Every SCE IP that sold more than 200k (and had a sequel). I thought it was only me and about 8 other people who loved PaRappa. Peace Walker, Dragon Quest Monster 2 DS, and Super Street Fighter IV. Maybe some other games, but those are the major ones. They didn't make the sequels for no one, you know. So how many copies of Nier actually shipped? Is this in line with expectations, or is it a bomb of epic proportions? Will I be able to pick up Replicant for 980 yen at Yodobashi? Etc. Seeing how it's completely sold out at Yodobashi on both the 360 and PS3 at 7000 yen, I'm going to say your dream of getting it for under 1000 yen won't be coming true soon. While I was wholeheartedly wrong in suggesting that Spirit Tracks was outperforming Phantom Hourglass, the shortened development time and re-used assets must mean that Nintendo's managed to eke some sort of respectable profit out of the release. Even then, cel-shading's not the problem when Phantom Hourglass did so well. Phantom Hourglass Didn't do so well though, it followed the same path as spirit tracks, after a few months Y980 in bargin bins all over the place. Those are all already out. Kind of surprised on that last one. I think he was talking about next weeks charts, could be wrong though. Ivy the Kiwi is nowhere to be found, is this the end of Yuji Naka?! Disgea adventure game is also not on the list, another unhappy day for the NIS teams. anyone (maybe jgaffers) has some news about that ? Nice numbers all around for the major titles. Wow, SSF4 is doing much better than I expected. DQMJ2 and Peace Walker are doing about what I expect. Generally I would expect DQMJ2 to pull more numbers over the weekend, because of the appeal to the younger audience, so it would be well past 600k and pretty close to my 700k prediction. PW should be able to pull another 100k over the weekend as well. As for SSF4, it's looking like it will probably sell over 100k combined. The PS3 version will probably do 70-80k in the first week at least. Very impressive. 1 day of sales for 4/29 releases. 2 days of sales for 4/48 releases. Looks like SSFIV will get reasonably close to SFIV, as I hinted at in last week's thread. 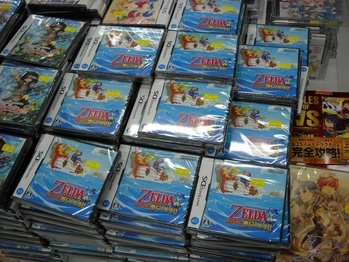 The price is right and Biohazard 5 Alternative Edition and even Tatsunoko vs. Capcom (2010) proved there's a demand for extended versions of some Capcom games. Yeah, I was expecting a dip because I wasn't sure how much the Japanese fanbase really embraced SF4 on consoles. The sales here clearly prove that they loved it and want more. The lack of an arcade release (at present) probably has a lot to do with it. YTD hardware and software sales changed this week (Media Create had 53 weeks for 2009 as I was suspecting). Enterbrain and Media Create will have again aligned yearly periods at 2013. That's a good point. I didn't really think of that. It'll probably be less for SSF4 at least. Sorry Sammy Samusu but I would quote this post either you were right or wrong. People predicting 600k+ for DQMJ2 lol. Previous Golden Golden had short legs for sales after we got first day numbers. I wonder if it will be the same this year. If not we are talking about some huge openings. Surprised and impressed by Joker 2, PW is just about on par with what I expected, and SSF4 underwhelms slightly. Is/will Golden Week sales be something of note for game sales? I'm not sure what the trend is normally but I would imagine we would see more sales numbers in the 100,000(overall) bracket for new releases? The sales for the week are only as noteworthy as the titles which are released. It so happens this year there are 2 major titles being released, so of course it's going to be something of note. Good for Square-Enix. In my defense, I didn't know we were predicting Golden Week level of numbers. Yay, decent numbers for everything -- and I feel pretty good about my predictions, too! Nice openings for the big three GW games. Seeing the good first day sales of PW I think Capcom will take notes from Konami/MGS W to make Resident Evil PSP (if the game exists) or at least one for the next generation of portables. 17	/	14	[NDS]	New Super Mario Bros.	(Nintendo)	- 6.461	/ ? 2) Total software: 650,000 units (+15.5%). Why the annual totals of all consoles are lower than last week? That is, the week 2009/12/28~2010/01/03 was being counted as 2010 for YTD, but (based on the Top 500 data) it was actually included in 2009. Therefore, Chris subtracted it and that is the result. He's probably doing YTD totals based on MC's definition of a year, which our understanding of changed since last week due to the 2009 Top 500 having gone through January 3, 2010. Huh. I know Famitsu != Media Create and all, but Famitsu gave it a first week of about 12K. I guess it must've been pretty front-loaded to still miss out on the yearly Top 500. Any chance of Galaxy 2 outselling the first one thanks to the new Mario mania? Mario mania was already going pretty big a few years ago thanks to the DS NSMB. It happens that I've just come from playing UmJammer Lammy, so I'd point out that it should really be lumped with these games. Re: Zelda Spirit Tracks sales. Despite (or because of) its bargain bin status, it hasn't tracked outside of the Media Create top 25 in the 18 weeks since its release. While sales per week obviously vary, its positioning on the charts has plateaued, it seems, over the past two months. Ehh, I don't think that's a fair way to put it. The reason Spirit Tracks is overstocked is because Phantom Hourglass did so well, and they wanted to make sure the supply was there for history to repeat. Peace Walker did as expected, DQMJ2 really did well though, much better than I thought and much better than the first entry. And the SCE data last page was depressing. I have faith in GT5 though. I had no idea what to expect from Peace Walker to be honest, glad it's doing well. SSF4 surprised me, it's doing better than I expected. Can we see Summon Night? I don't like I'm doing this for Sega but I must give some credit to the company that gave new meaning to what ''free fall'' means. Only series with an entry>200k otherwise the list would be endless. At least we miss every Sega game from Mega Drive and before or things would look much worse. Naka 'ended' when he left Sonic Team. Sequels don't really sell that much, I usually think it's hard for a sequel to repeat the success of the first game. Mario Galaxy wasn't a crazy success to begin with, despite selling well and being a great game. I'm pretty positive Galaxy 2 will underperform in our eyes. I would LOVE to eat crow in my predictions, though. I think it might sell less than Galaxy 1, I'd love to be wrong tho.